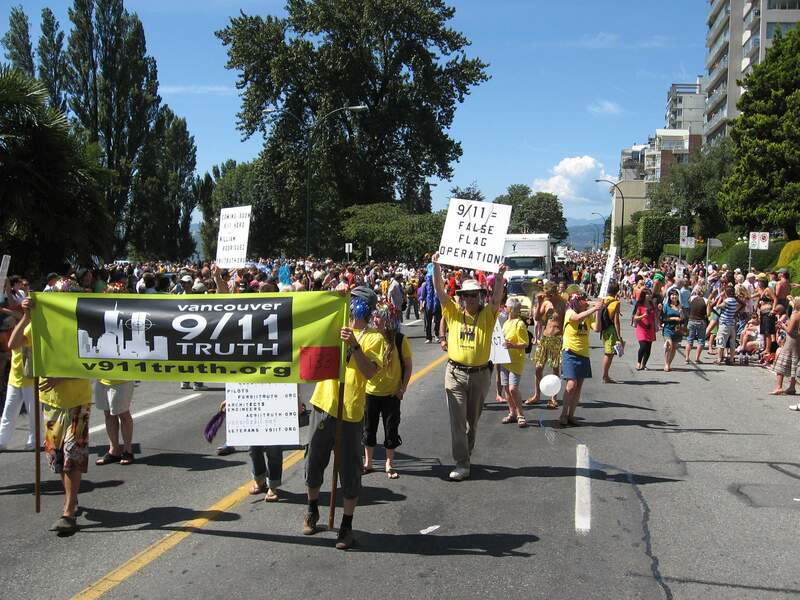 9/11 Truth embraced by the Vancouver Pride Parade and over 300,000 people! High-res shots attached at bottom. Well, yesterday was absolutely incredible. Clear blue skies, and perfect temperatures to be outside in the sun. Though some in our group at first had reservations about participating in a parade meant to show support and acceptance to Vancouver's gay and lesbian community, I am very happy to say it was our most successful group action so far. An estimated three hundred thousand open minded and curious people saw our message and unity, and we quite nearly ran out of free material to give away. Though I personally was manning the "home base" tent on the beach with a few others while the parade and crowds were winding their way towards us, there was a tremendous amount of positive feedback displayed during the parade, with some people erupting into spontaneous applause and chants of "9/11 was an inside job!" To be sure, there were a few negative outbursts as well, but these were outnumbered by far by the amount of cheers, support, and thanks that we received. I saw quite a few buttons in the crowd from our June conference, and many familiar faces. For a few new friends that had come to the conference, it was their first participation in street-level 9/11 activism, and what a way to start! 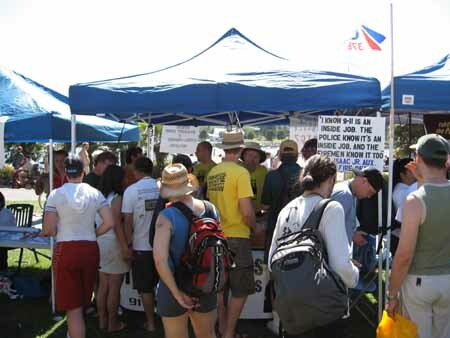 It was quite different than my initial Vancouver 9/11 truth experiences, when there were only three of us with a lopsided card table getting sunburnt while being told by antiwar organizers to go home for making them "look bad". Today, the 9/11 truth community is organized, manifold, and committed. On the beach, we were situated next to Hettie Fry of the Liberal party, and we attracted far more support and attention. I had a chance to have a frank discussion with one gentleman from the party about how they could win my support (addressing 9/11 truth to end the war and putting an end to the S.P.P. respectively.) Though he was not overly willing to make any promises, the lights in his eyes danced at the thought of destroying political support for the war (and by extension, the Conservative party) with 9/11 truth. I remain hopeful, and my spirits were lifted considerably by every person that came by and thanked us, particularly the Americans, who often pointed out their nationality and wish that they could see more of the same in their own country. I'd have to say one of the best resources we had was a landscape-formatted duotang color printout of the members of www.patriotsquestion911.com . It gave more than a few people pause to see so many respected people in their fields putting their careers and reputations on the line to talk about the issues. We also gave out hundreds of $2 dvds (to cover manufacturing costs), the most pushed being "9/11 Mysteries". It was also explained to all that if they did not want to purchase them, to write down their names and view them online for free, which many people did. Though it is not visible in the picture, 911blogger.com and 911truth.org were adorned proudly across the front of our tent, and several websites were listed on a color fact sheet flyer, of which we gave away several thousand. In short, this event has cemented 9/11 truth as a mainstream political reality in Vancouver, and I can't wait to take some of that energy for our truth action at the art gallery this August 11th. As ever, I'm very proud to be part of this patriot community. PS: I'm the yellowshirt in the booth on the left with the shades on. Not to copy Mark Dice, it was just really bright out. Daricus on Wed, 08/08/2007 - 4:52am. We need to be reaching out to people everywhere. Creative thinking and well done! Crystal on Wed, 08/08/2007 - 5:41pm. ...and extend the reach of 9/11 Truth! Well, well done. We all should be looking for large gatherings of any sponsorship to which we can add our presence. altruist on Wed, 08/08/2007 - 7:01pm.